Officials travelled to China this week, seeking to agree an extension to a currency swap between both countries: a way to boost the Central Bank’s foreign currency reserves. Following the government’s recent agreement with the International Monetary Fund (IMF), officials travelled to China this week, seeking to agree an extension to a currency swap between both countries – a way to boost the Central Bank’s foreign currency reserves. Leading a large delegation of officials, Central Bank chief Guido Sandleris and Finance Minister Nicolás Dujovne arrived in Beijing on Wednesday for a host of meetings, including one between Sandleris and China’s Central Bank head Gang Yi. According to reports in the local financial press, the Central Bank chief asked his Chinese counterpart to extend an existing currency swap between the nations by an extra US$9 billion, or 60 billion yuan. If agreed, Argentina’s exchange with the Asian giant would reach US$20 billion, topping up the US$11 billion agreed between both countries in October 2014. Based on that accord, the Central Bank would be able to use the funds when it considers most convenient. That means it could use them to intervene in the exchange market. The talks with China come in the wake of the agreement with the IMF, whose executive board recently approved a US$56.3-billion credit line for the country, secured as part of a revised agreement. Argentina will receive about US$35.8 billion throughout the remainder of this year and all of 2019, representing a near US$19-billion increase from the original arrangement with the Fund. In their meeting, Sandleris and Yi also discussed the “international financial scenario” and the new monetary plans implemented by Argentina, while reviewing the preparations for the G20 summit in Buenos Aires, according to a press release from the Central Bank. 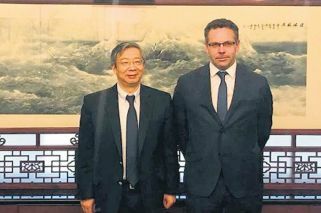 The government officials also met with representatives from the Chinese Popular Bank, China International Corporation, Sinosure (a state firm that gives credit insurances for exports), China’s Development Bank and the Export-Import Bank of China (also known as Exim Bank). Seeking new funds for Chinese projects in Argentina, Sandleris and Dujovne told investors that the balance-ofpayments crisis was now behind the nation and that the country would see an economic recovery after April, when the recession would come to an end. Chinese president Xi Jinping is due to attend the G20 Leaders Summit in Buenos Aires at the turn of the coming month. During his visit, he is expected to put the final touches on agreement to construct a new nuclear plant in Argentina, set to be built in 2022 with entirely Chinese funding – anticipated to be around US$9 billion. Over the past decade, Argentina’s relationship with China has substantially deepened. In just the last few years alone, the countries have signed more than 20 treaties. Argentina now enjoys what is called a “comprehensive strategic alliance” with the Asian giant, a diplomatic status with Beijing that few countries have access to. The close relationship has also led to a rush of Chinese investment in the country. A total of US$20 billion in loans have been granted to finance a number of projects. But though China has guaranteed funding for key energy and transportation works projects, such as dams and nuclear power plants, Argentina has authorised contracts for works projects without a prior tender process, opening the door to Chinese labour, a move that has met with criticism from the Argentine Industrial Union (UIA). The relationship between both countries is longstanding, dating back to the Kirchnerite era. The current administration, which took power in 2015, was not initially less than enthusiastic about having a close relationship with Beijing. President Macri initially questioned the previous government’s ties with Beijing, citing the type of contracts signed and an apparent lack of transparency. However, the president later backtracked on that position, given his government’s intense need of foreign investment. As part of that shift, Macri visited China last year and signed a number of deals, mainly focused on energy and transportation. For example, Beijing is set to fund public works projects related to the San Martín freight train line.